Most corn is shelled as a part of harvesting operation. Farmers who grow both small grain and corn use a corn-harvesting attachment on the combine and let the threshing unit shell the corn. Corn farmers are using a shelling attachment in combination with the corn picker. Where corn is harvested with the husk left on the ear or the husk removed, corn shellers are required to prepare the corn for the shelled-corn market. There are two types of corn shellers: the spring and the cylinder. The spring sheller has a plate under spring pressure to hold the ears against a rotating disc which loosens and separates the kernels from the cobs. The kernels pass downward through the cleaning unit, while the cobs are ejected by conveyors. The stationary large industrial and the small farm units. The industrial sizes are used by corn buyers, while the smaller are used on farms where a large quantity of corn is shelled. 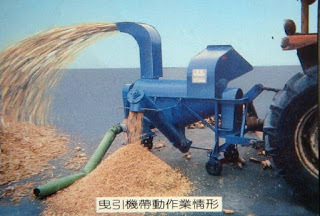 Truck-mounted portable auxiliary engine-driven types can be used for custom shelling from farm to farm. Two-wheel trailing portable power takeoff-driven types can be moved to different locations and used for custom work. The tractor-mounted power-takeoff-driven type has the same general uses as the two-wheel trailing type. The power requirements of a corn sheller will vary from 10 to 35 hp, the cylinder speed ranges from 600 to 1000 r/min, and the capacity is influenced by the percentage of husk on the ears, the moisture content of the kernels, the rate of feeding, and the size of the cylinder. The large stationary units will shell from 100 to 250 bushels per hour. Some corn shellers are equipped with blowers to handle both the shelled corn and the cobs separately. Sacking attachments are available for some of the portable units. Smith wilkes. Farm machinery and equipment. TMH edition. 0 Response to "Corn Shellers"